Ruby red at the core with slight garnet reflections, this intense Barolo has an ethereal nose, with powerful aromas of dried fruit, jam, licorice, and violet. A rich, full-bodied wine, it is warm and quite soft, with evident but ripe and sweet tannins. 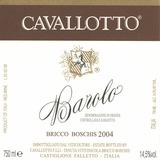 This Barolo would pair well with red meat, typical cheeses, or game dishes. A firm, dense backbone of acidity and tannins shores up this red's cherry, strawberry, mint, tobacco and iron flavors. A beam of suc- culent acidity extends the long, spicy aftertaste. Best from 2020 through 2036.- B.S.